how would i go about stopping this? thank you! hi!! oh, no, it’s just what the image looks like if i right click the picture on toyhou.se and click “open in new tab”! That’s strange, cause it’s definitely uploading transparent like it should. What browser are u using ? I get this for reference ! Last time I remember this happening, the original user uploaded a file where they were working in CMYK. Please doublecheck your colorspace (internet generally uses sRGB as their ICC profile) in photoshop! Wonderland that looks like what i'm getting too; i wonder what the problem is?? Pepperly when i check in photoshop, it says the file is set to RBG. should i change to CMYK and see if that works? archangel when i view the character in the gallery as-is! sorry for the lack of clarification. the version on the right is what i got when i opened the image in a new tab, then pasted it into photoshop. Are you using a dark version of chrome ? No. The huge problem was that it was in CMYK while the internet uses sRGB, and Photoshop by default uses AdobeRGB instead. 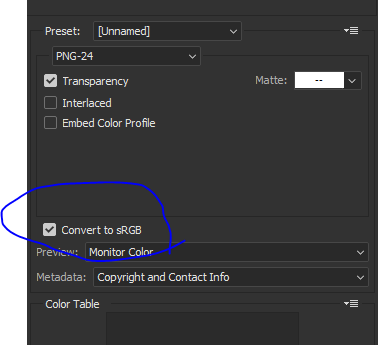 As a quick solution, I recommend choosing "Save for Web" instead of "Save As" and making sure you save as a PNG-24 for with "Convert to sRGB on". Pepperly it worked!! thank you SO much, i'm insanely grateful ♥ and thank you everybody for pitching in!